You can plant annual flowers in just about any container and quirky junk shop finds are my favourites. There’s just a few things to know for successful planting in odd containers which I’ll explain below. Otherwise, if it will look sweet with some flowers in it, plant it—just like these broken bird baths. Here’s my haul from the junk shop. I look for anything that appeals to me. Pretty complicated, I know. 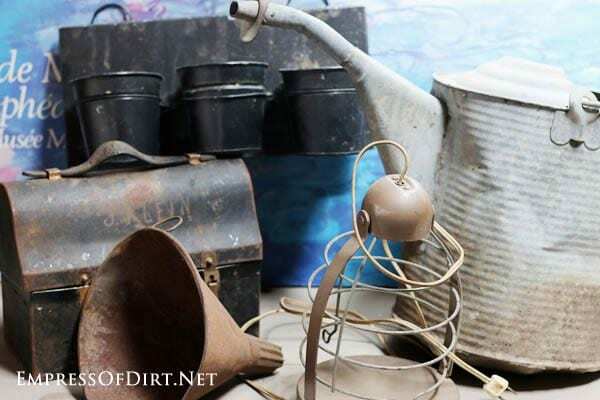 Keep in mind that old junk is great for decorative plantings—not food crops—as you never know if the old paints, finishes, and materials are food safe. Fruits and veggies need food-safe containers and organic potting mix intended for food crops. 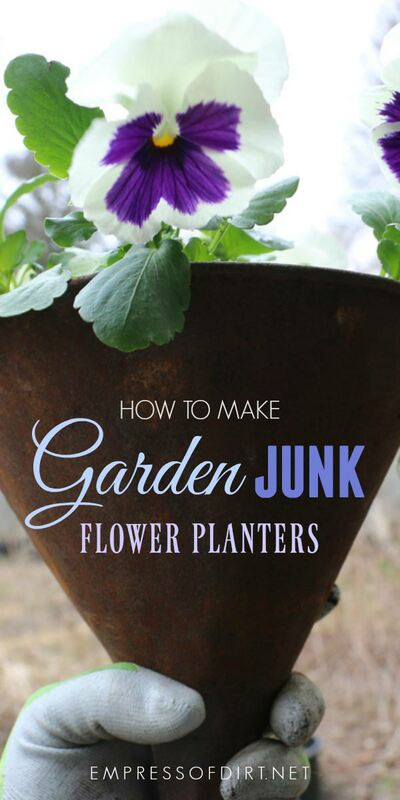 Flowers and other decorative annuas are fine in junk planters. 1. Is there enough room for the plant roots now (and for future growth)? 2. Is it strong enough to hold the soil? 3. Are there drainage holes or can I add some? 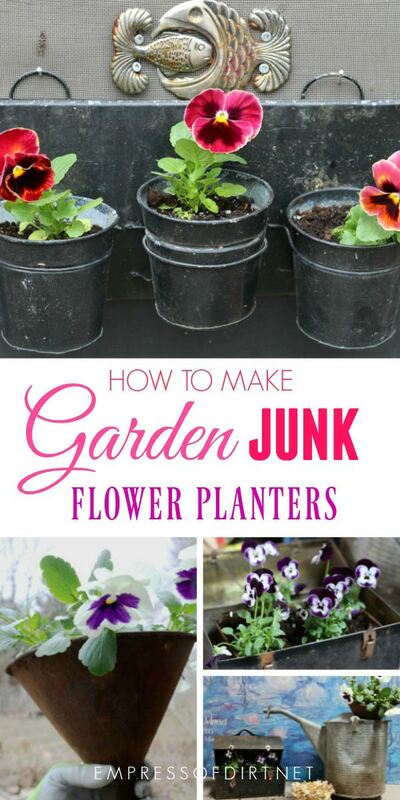 I’ll show you how I planted these junk finds. 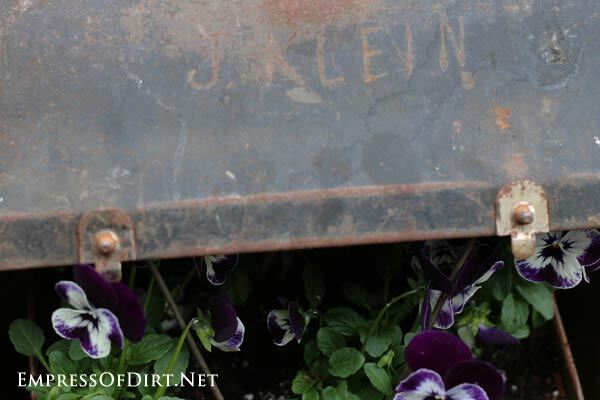 Make a DIY wheelbarrow garden trug—it’s a handy tool caddy and planter all in one! The moment I saw this old metal lunchbox, I knew exactly what I wanted to do. It’s the perfect setting for some gorgeous purple and white pansies. The colours remind me of Amish clothing and quilts with the solid purples and blacks—the same colours that inspried me to become a quilter. To plant it, I inserted a small metal loaf pan (that already has drainage holes in it) right into the lunchbox. This makes is super easy to remove and adjust the plants as needed. You’ll notice the pansies are not filling the space. They will grow so much larger that it’s best to start with a modest amount. By mid-summer it will be overflowing with flowers and greenery. The metal thermos-holder holds the lid nicely in place. 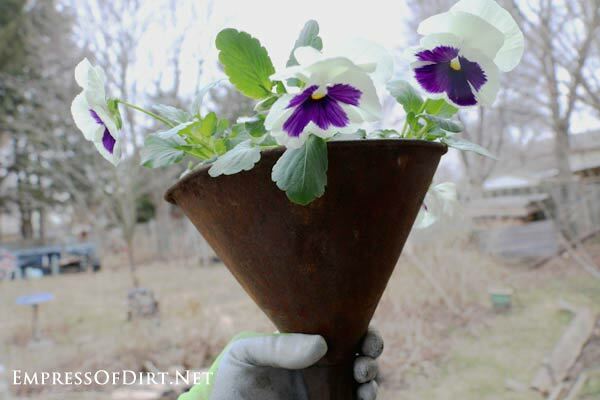 This metal funnel is rusty junk perfection. I placed a large marble in the spout to slow the release of water, and added two paper coffee filters to the bottom. This will keep the soil from running out the bottom. 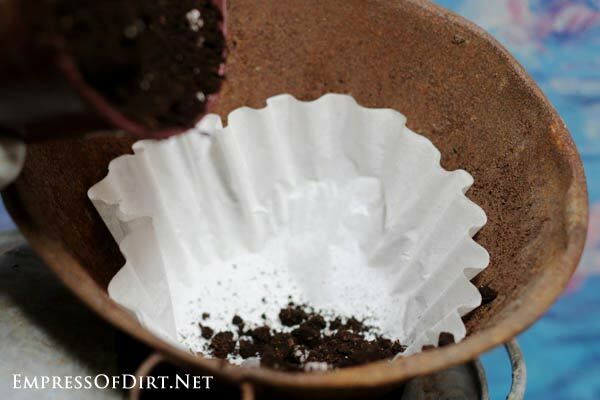 Other options besides coffee filters include: scraps of cloth, window screen, flat marbles, clay shards…. For the record, I rarely add stones to the bottom of containers as I do not think they are necessary. So long as there is some drainage to prevent water build-up, it’s all good. 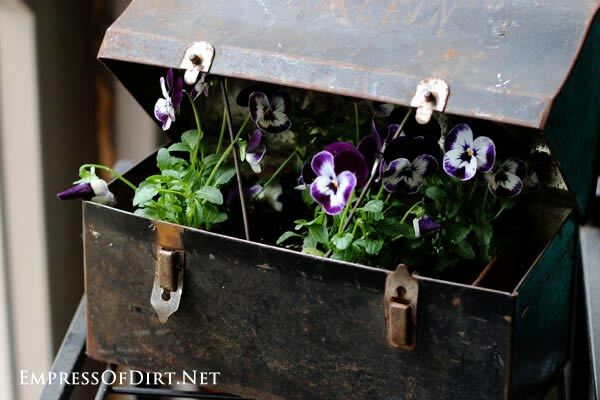 Plus, you want as much root-growing space as possible, so the area is best given to the container mix. I use potting mix suitable for flowers in containers (look for organic mix) and composted manure. 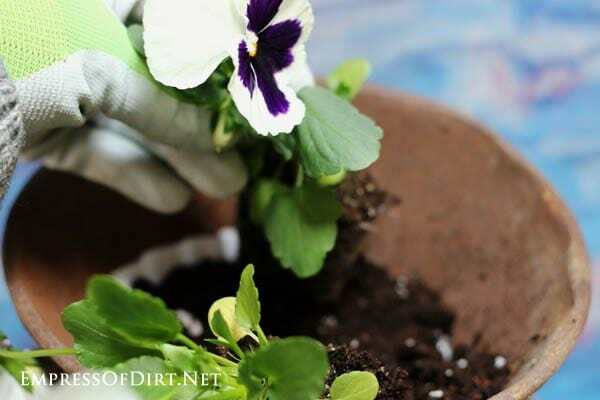 Be sure to leave about an inch or so from the rim so the water doesn’t spill over when you’re watering the soil. 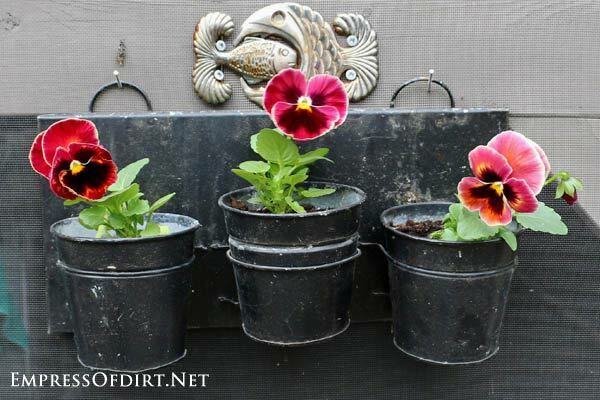 I am a pansy fanatic and love entire containers filled with a single variety. I love how these ones look hand-painted. These old electric chick heaters are super easy to use as pot containers because they are hinged for easy access to the lightbulb (no longer in use here, of course). 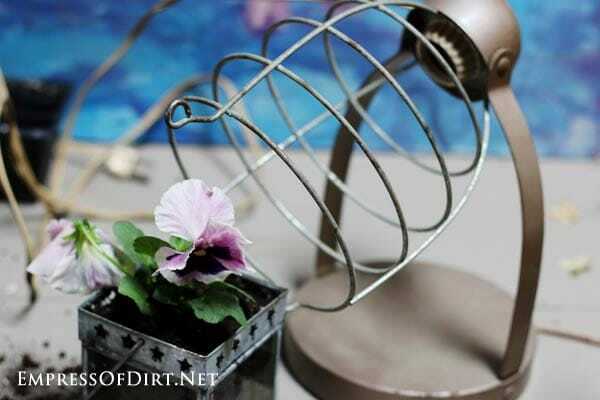 Here I added some pansies to a glass candle holder and placed it in the wire area. I forgot to take an AFTER pic so you will have to imagine the candle holder actually in the heater. Good job. These mini pots are hanging on our patio door. Normally I cram planters full of a variety of plants, but pansies don’t need anything but a solid backdrop to show off their beauty. These pots have actually rusted on the bottom so the drainage is built in. And the plants will do just fine for the growing season so long as they are never left to dry out. Happy junk hunting to you! Broken Bird Bath? Plant It! I acquired a blue speckled child’s potty that I plan to use as a planter. Should I drill a hole in the bottom or put in rocks, etc.? 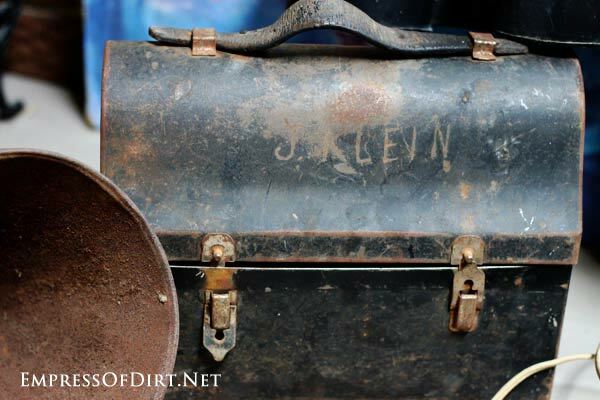 I love the old lunch box and especially because my ancestors name was Klein. And that looks about the right era LOL. great blog post. Thanks for sharing. Thanks those are great container idea planters, i usually find great stuff at estate sales cheap.Just so happens there is one in the paper for this weekend. This came just in time,have a great weekend. Thanks and have a good weekend, Marlene!